It wouldn't be a build-up to Christmas in soap-land without some drama right?! Last night's Coronation Street saw Robert and Kate agree to have a baby and keep their partners Michelle and Rana in the dark for time time being. Next week's Coronation Street sees them pay a visit to resident lawyer Adam, in order to draw up a contract, something Imran isn't happy about when he realizes that Rana is in the dark. Robert does temporarily manage to wriggle out of Michelle's suspicions when confronted by saying he needed some time alone to think, but he hates lying to her. Toyah then recommends a colleague when Michelle enquires about counselling for a matter related to Ruairi. 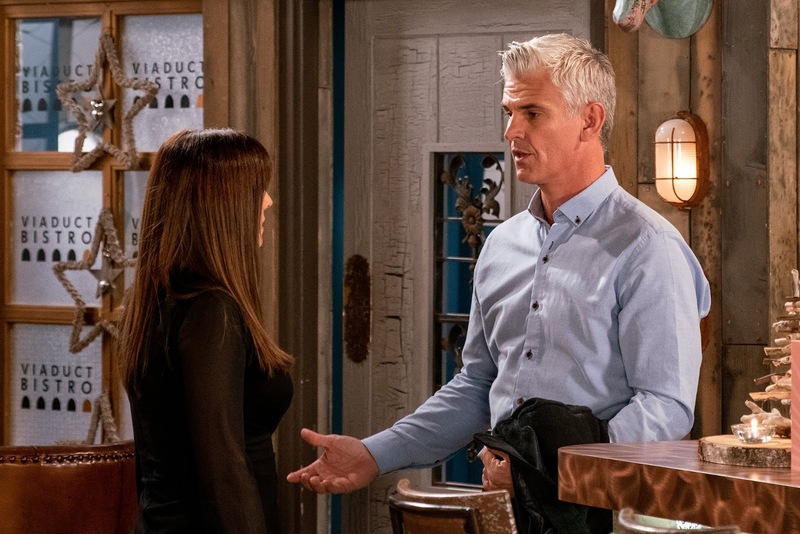 On Friday Robert finds himself caught between two women, as Robert spots Michelle leaving her counselling session and panicking, bundles Kate in to a cupboard. After the session, Robert confirms he wishes to go ahead with their plan, but they both know they can't keep Michelle and Rana in the dark any longer. Kate tells Rana they need to talk, but Michelle reveals all about her counselling session before Robert gets a chance to tell her about his plans with Kate, and further stuns him when she reveals she'll consider trying for a baby, causing Robert to forget his commitment to Kate. In the second half of Friday's episode, Kate waits to tell Rana all at the medical centre but will Robert be able to reach her before she spills all? You can watch all this play out between the 10th - 14th December and be sure that we will have A LOT of thoughts in our post-ep review. In the meantime, continue dying over cuteness from Friday's episode, I know I am!